We have been super busy finishing our next book, which we hope to publish in May 2017. In the meantime, catch us on our YouTube Channel and on Shane & Friends (new podcast airing on Fullscreen and Soundcloud in April or May) Our new collab videos with SUPERFRUIT are up now, on our channel and on theirs. We are geeking out! Yes, we actually got to sing with Mitch and Scott from Pentatonix, in four-part harmony! How cool is that? Following is a brief excerpt from our bestselling book Psychic Intelligence. We hope you enjoy it! Clairsentience differs from claircognizance in the sense that the latter is a more intellectual type of knowing while the former occurs as a strong physical or emotional reaction in the body. Clairsentients often walk into a house and immediately sense that the energy is positive or negative. What they are picking up on may be the energy of people who have been there, not the house itself. People who have visited Gettysburg or other famous battlegrounds have reported feeling fear, anger, or pain, which is the spirit energy of the soldiers who died there. Clairsentients may also the feel fear of other patients in a dentist’s office or the reverence of former worshippers in a church or cathedral. Again, they are feeling the lingering energy of those who have been in that particular space. Because they are so sensitive, it is particularly important for clairsentients to protect themselves from the negativity of others. The two of us had to learn to protect ourselves from being affected by the toxic energy of other people so that we would not become physically and emotionally drained. We have felt stabbing pains in our back or stomach around very disturbed people. If you are feeling very uncomfortable, it is wise to remove yourself from the situation. Take a walk outside if you can. Find a quiet place to sit, and imagine the negative energy like a dark shape that moves down your legs and through the soles of your feet, leaving your body and going into the earth. There are many different degrees of clairsentience, ranging from “feeling” other people’s pain or illness in your own body, which is medical intuition, to feeling other people’s emotions. Clairsentients may, for example, feel a tightening in the chest or a pain in some specific part of their body that lets them know another person is suffering from a particular illness. Very often, we’ve both been doubled over with abdominal pain when we’re doing a reading for someone who is holding onto some emotional pain he or she desperately needs to let go. In effect, we can feel that person’s pain or anger even when he or she isn’t willing or able to acknowledge it. If you are clairsentient, you may also experience moments when you are suddenly overcome by a wave of emotion, such as sadness, or anxiety that has no logical cause. What’s happening then is that you’re picking up these emotions from other people—particularly people who are depressed— in your environment. If you ever get a strong feeling to avoid a certain person or situation, trust that feeling, even if it doesn’t make sense right away. Heed that inner feeling. You may also get a bad “vibe” when you meet someone for the first time, and this too is clairsentience. Trust that gut feeling! Sometimes it may actually come in the form of a tummy ache or a pain in the neck, because those who are clairsentient may feel pain in their neck, back, or stomach or even feel faint when they are with someone who is especially negative. By the same token, they may feel a sense of safety, comfort, or well-being around someone who is very spiritual. For that very reason clairsentients should try to surround themselves with as many upbeat, happy, and confident people as possible. … and we’ll see you in the future. **As a side note here, we have many people online who are making up lies about our predictions, because they are afraid of what they don’t understand. We share this not as a victory lap, but to correct misunderstandings and in our own defense. We appreciate all of you who have helped to defend our work over the years, and who have contradicted the false stories about us online. We NEVER doctor our radio shows or YouTube videos or edit them after they air. That is why we make our predictions on the shows that other people own. YOUTUBE CHANNEL: HELP US GET TO ONE MILLION SUBSCRIBERS! Thanks for helping our new YouTube Channel become the fastest-growing of all time! We now have nearly 700,000 subscribers in just 12 months. ‘The Psychic Twins’ YouTube Channel – Click here to subscribe! READERS ARE RAVING ABOUT DIED TOO YOUNG! LOVE IT!! NOSTRADAMUS IN STILETTOS HAVE DONE IT AGAIN! This book is absolutely brilliant on so many levels! The Psychic Twins have done it again… they are simply beyond amazing! Spectacular Reading – 5 Stars! Absolutely loved reading this book. Couldn’t put it down! Can’t wait for the next one to come out. Wow! My mind is blown reading Died Too Young! Not enough stars in the skies to rate this one…. Another extraordinary gift has been given us by Terry and Linda Jamison with this wonderful book! 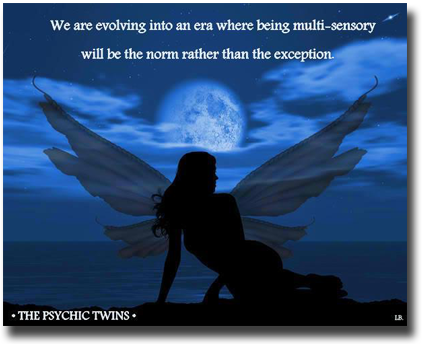 The Psychic Twins have provided insights and and answers to so many mysteries which have long haunted us. Their compassionate dialogue, especially with those stars who endured unspeakable emotional and physical abuse while being held prisoner in the spotlight of fame, was especially moving… giving voice to their suffering and meaning to their incomplete lives. This is an inspiration to all of us left to ponder the meaning of fame, and life after death. We have been blessed with two angels that can pierce the veil of illusion separating us from our loved ones passing before us… This book is a rare enchantment to be treasured, inspiring us with the beauty of the higher dimensions beyond life and the marvels in life after death. THIS BOOK IS PURE MAGIC!! Terry & Linda did a phenomenal job channeling all of these beautiful souls. I was shedding tears as I read these amazing messages of wisdom. A beacon of light & truth! 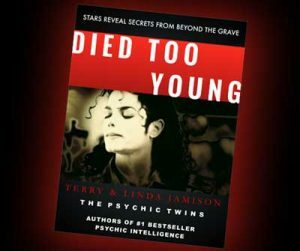 Amazing and life altering read… “Died Too Young” is helping me to look at my life with a new vigor. Twin Hearts is available for download or for purchase as a high quality CD, delivered directly to your front door. Spirit wants to assist you in finding your divine soulmate. 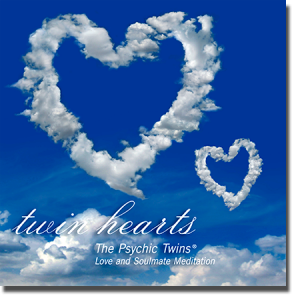 Twin Hearts is an inspirational meditation CD of original spoken affirmations, written by The Psychic Twins, accompanied by peaceful, healing music. These empowering words will help you to relax, shift your beliefs regarding relationships, and open your heart to receive love. I am a huge fan and supporter. After being single for 5 yrs and many dysfunctional relationships, I purchased your “Love” CD. I listened to it every single night. Within a month – I met a wonderful man! I truly believe he is my soul mate and that listening to your tape truly helped my heart open so I could receive true love. I want that!!! I need to add that to my X-mas list! I bought five of them for friends as a gift — they love them too! …looking forward to your new book! This is a great cd! I can feel the shift occurring each time I listen to it…wonderful. I got your Soulmate CD “Twin Hearts” in the mail today and put it in my DVD player to listen to it through my entertainment center. I really felt so much better after listening to it! I put it in my CD player on continuous repeat all night long so I can listen to it while I am sleeping. Thank you! This is a record. I don’t think that there are any predictions that are left that the twins made that have not come true already. Now you all see why I believe in them. No one else in the world can match their track record and talent (gift). That is why I wrote the article The Psychic Twins: Oracles of the 21st Century. Thank you, Linda and Terry, for everything! You are angels among us. If government was clever you could be President Obama’s best advisors! You are miracles and an amazing inspiration. I just wanted to say how truly grateful I am to both of you for your empowering words of hope, wisdom, and faith. I cannot begin to explain to you how much your book “Psychic Intelligence” has enlightened my life, and in the process, the lives of others. You teach of happiness and love, and live by it as well, and I appreciate your sincerity and generous hearts. Linda and Terry Jamison are women of deep character, passion, confidence and integrity with gifts that display truth and power on every level. They bring to their work so much more than their very evident and proven psychic abilities – they emanate an energy that comes straight from their hearts allowing others to know they are connecting to their unique essence and needs in a truly open, powerful and authentic way. When I first learned of the twins, I was a fan. When I read their books they became my heroes, but then I started to listen to them… to really listen. Not only to their predictions, but to them, and what I heard were two beautiful spirits who choose every day to help others, and in doing so I found Kindred Spirits. The Psychic Twins are the most documented psychics in history. Their amazing world predictions include terrorist attacks, medical breakthroughs, national and natural disasters, the U.S. economy, stock market crashes, et al. Because they keep files on all predictions they write, The Psychic Twins were able to locate at least five different documents of their channeled writing which specifically foretold these events of 9/11 for the year 2001. The Psychic Twins have mind-blowing ESP! They offered us proof on tape of 9/11 and their other amazing world predictions. I’m obsessed with The Psychic Twins! Terry and Linda are so spectacular and they’ve predicted so many insanely accurate things. Their new book Psychic Intelligence is a classic! I saw you on The View and I am extremely amazed at the accomplishments that the two of you have achieved! Fire all of homeland security and hire Terry and Linda Jamison! I have watched every show you two have been on. You two have such a wonderful spirit and great sense of humor. Thank you for your beauty, grace and spirit. The charisma and power you two have is just unbelievable, and a confirmation of your being genuine and sincere. SEPARATED AT EARTH: The Story of the Psychic Twins is the inspiring, amazing story of the world-famous Psychic Twins, Terry and Linda Jamison. “The Psychic Twins” are internationally acclaimed for their astounding predictions of the 9/11 World Trade Center and Pentagon attacks, and the 2000 stock market crash (all on national radio show Art Bell, 1999.) Separated at Earth is the inspiring, amazing true story and it is available on Amazon.com by clicking here. The Psychic Twins’ #1 Best Selling book is available for purchase at Amazon.com! and a bookstore near you right now! In their new book Psychic Intelligence, Terry and Linda Jamison explain, step-by-step, how to dissolve the blocks that can prevent you from using and trusting your own intuition. Visit Amazon.com now and purchase The Psychic Twins’ second book, “Psychic Intelligence”. This book is available right now by clicking on the following link. Click here to visit Amazon.com. Psychic Intelligence is a good read – intelligent, yet easy to understand. Psychic Intelligence should be at the top of Oprah’s list for her Book Club 2.0 because it’s a groundbreaking book by the world’s most documented accurate psychics. Your book gives really practical and helpful advice anyone can use for bettering their lives and improving their situation. Highly recommended. Psychic Intelligence By Terry and Linda Jamison is one of the best books I have ever read! We are all psychic, and this book shows you how to tap into it step by step! My 16 year-old daughter is reading it now and she has found out she has more abilities than she thought she had, and has also gained new psychic and spiritual abilities that I’ve noticed. Terry and Linda have helped awaken more of my child’s psychic abilities and I am very grateful of this. I am just simply fascinated! I highly recommend this book for Oprah’s Book Club! On a 1 to 10 scale, I say10 hands down and over the top!! Thank you for sharing your wisdom/knowledge with us in the way that you do and helping others not feel “weird” for believing in and having heightened intuition. You help us not feel alone, and you give us the tools to help ourselves. I never expected I could be this blown away! I finally understand everyone before me and how they raved about Psychic Intelligence. I feel like a kid in a candy store or something when I talk about it! I’m just excited and thankful! Yay! I have seen and heard of other psychics in this life, but you two are just beyond! Your track record and your help with so many people in this life is amazing. I truly believe God has placed you in this lifetime as a guide for humanity. for being alive and showing us the future so clearly! Lady Gaga’s got nothing on you two. You give the world hope and you do it with such humility and compassion. Hope is something that is sorely needed in the world right now. You’re super connected to the Source. You are both such pure souls, real gems… the real deal… you carry the energy that could heal the world. You help the world as we search for the divine, you represent the highest energy — the essence of love. With individuals like you the community around us is blessed. You represent the highest expression of love & consciousness. Bravo, great teachers, BRAVO. Your gifts are so much more important than showmanship, curiosity and money. They hold among them the unique attributes to help usher greater and greater bits of heaven unto earth by eliminating darkness and illuminating truth. I hope you continue your “war” on darkness and ignorance. I think the government should listen to your predictions more, as you have a 100% track record that no one else can claim. You both are the real deal… in the psychic world, you are my idols! Many psychics and mediums have egos, you both don’t. You’re spot on every time.